PVC Insulation Tape, also known as Electrical Tape, is a pressure-sensitive adhesive tape that is used for insulating cables, electric wires and other products that conduct electricity. The tape is specially designed for use in the electricity sector. 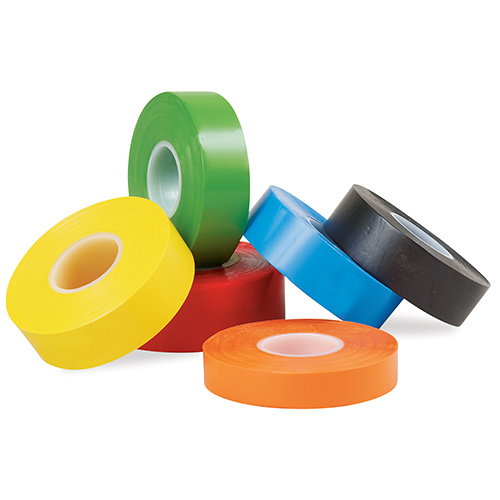 The PVC Insulation Tape offered by Omni is available in six different colours including yellow, green, red, orange, black and blue. The different colours make it easy for customers to mark and identify items and use them when required. The tape has flame retardant properties which make it just right for application in all electricity-related tasks. This premium quality heavy-duty tape can resist extreme weather conditions, corrosion, and exposure to acids and alkalies, making it suitable for use both indoors and outdoors. The PVC Electrical Tape is user-friendly and highly flexible and can be applied easily on any range of circuits, wires and connections. Professionals can use the tape for all kinds of tasks and be assured of their safety. Each of the tapes offered by Omni is of premium quality and is fit for industry application. Keeping the different requirements of customers in mind, the tapes are available in various sizes and come with the option of custom sizing as well.